World Bank and IMF: Where do they stand on progressive and responsible taxation? Notes from the 2017 World Bank and IMF Annual Meetings session on the IMF's approach to fiscal space, women and work, 11 October. The session explores key aspects of how women’s equality in work can be achieved, with a focus on the importance of fiscal space. It demonstrates critical perspectives and evidence on how the IMF’s advice and policies is impacting the struggle for gender and economic equality. How does the IMF think that fiscal space contributes to gender equality? Increasing female labour force participation, what fiscal policy measures can contribute to that? For example, the provision of child care. Tax incentives could also contribute to this. We are also thinking about the wage gap. Subsidising job training, or thinking about how to move women into more male-dominated technical fields. 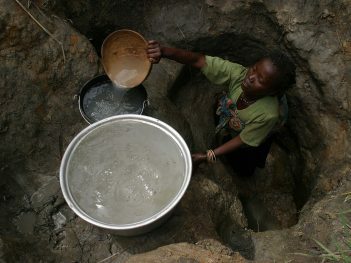 Thinking of women at home, infrastructure can make a big difference. I’m talking about water, roads, electricity, the provision of all of these have been shown to free up women’s time burdens and can make a significant difference. What are the commonalities of all these policies? To implement them you need fiscal space. Without fiscal space policymakers will have to make difficult choices. While the policy choices being made right now aren’t always aware of their gendered implications, we have to keep in mind that current policy choices might benefit others in other ways. The reality is there is a limited budget with competing demands. So should we despair? No, because fiscal space is not a fixed state, it can be created. On the revenue side, on domestic resource mobilisation, this is a very important priority. This is an area where the fund has spent quite some resources, especially in revenue administration. The second priority is on expenditure prioritisation. We’ve made progress on that, especially on gender-responsive budgeting for example. It is a tool that lets us see gender discriminatory outcomes. And then make better choices. 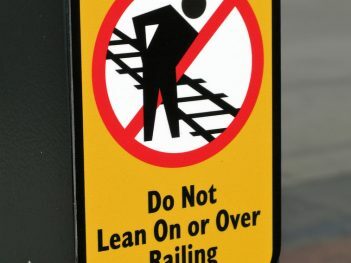 But we should all be cautious there is always a limited envelope, there are difficult trade-offs, these are hard decisions. Making progress on gender equality requires action that goes way beyond fiscal policy. It also involves labour policy, the private sector, etc. we shouldn’t be fooled to think if we gain fiscal space we will make progress. We need a multipronged approach. 2. Where do you think the IMF’s current policies and practice is at, where is the future direction? We pledge to further strengthen our policy advice and analysis to support female labor force participation. We promise to continue our work to address gender data gaps, with the aim of supporting the financial inclusion of women. We commit to push forward our work on gender budgeting, including through policy advice to member countries. We will build on recent research with the objective of helping to break down the discriminatory effects of legal restrictions. We’ve made progress on all of these areas. Are these initiatives making a difference? Yes, there is take-up and interest by our member states. Some countries have included gender in their labour policies. You have loan programmes with gender now as well. We are also working on socially optimal tax transfer systems. This is highly technical. Socially optimal taxes and transfer system and what the role of is of female labour force participation in that. We are hoping to complete this in the next six months. We are also integrating gender objectives into our TA. We are making quite a bit of progress there, in particular in public financial management. In Cambodia, Ukraine and others, we’ve started working on this. Why is fiscal policy so important? Fiscal policy allows us the opportunity to recognise, reduce and redistribute women’s unpaid care work. We are delighted to hear what is going on at the IMF. We agree this is a very important issue, we probably just disagree a little on how to go about this issue. If I think about recognising, redistributing and reducing unpaid care work, I begin by looking at time use surveys. There are enormous gender gaps and those boundaries break down in different contexts in different reasons. Men spend more time on paid work, women’s time burden on work overall is larger across the globe. We know that these gaps diminish in contexts where there is strong social protection, there are strong labour protections, and where there is greater investment in health and education. So that said, we need fiscal space and we know that the amount of fiscal space is not static. We know increasing female labour force participation rates creates more fiscal space for example. 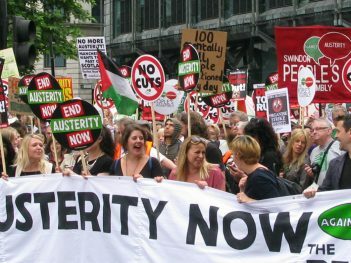 However, it is important to understand that austerity is not necessarily the answer. We have learned that in the recent crisis once again. Those countries who did not apply heavy austerity recovered much faster. What are the investments needed that run parallel to increasing female labour force participation? Resolving care deficits is one, others include WASH, water, sanitation, hygiene, but also energy and electricity infrastructure. 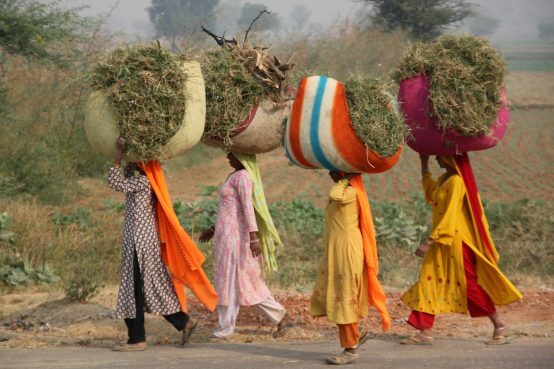 If you reduce the burden of collecting those resources you free up women’s time. In the Philippines, things were most acute in the 80s, when we did austerity and had an IMF programme. We are still experiencing the negative impacts of that. Since then, as the Fund has implemented programmes across the globe, I find little change in pushing these austerity measures. We still see IMF programmes keeping deficits very small, always interested in cutting non-essential expenditures, which almost always leads to cutting health, teachers, etc. So my first point is that I find that a number of the initiatives Maria has been sharing today fine but we have been saying these things for many, many years already, for example, to ensure the macroeconomic conditions are created for gender equality and that the conditions of jobs matter. However, I find many of these ‘new’ initiatives to be in contradiction with the mainstream policies of the IMF of the last three decades and I don’t know how they are going to solve this contradiction. On the one hand they are having these good intentions, but on the other hand its other policies totally negate it. Austerity measures run totally in contradiction to what we need. I guess the test of this is how such objectives for increasing gender equality can be met in times of crisis, where the IMF does most of its work. When will it actually rethink the standard, knee-jerk policy package in times of crisis? What are the sort of policies people in Asia would want to see from the IMF? To be honest most people are advocating there should be policy space, meaning for our people to define our own economic policies and programmes. It is not so much that the IMF should improve. The sentiment on the ground is rather they should leave us alone. The IMF’s presence in Asia, because of the decades of our experiences with them, is seen as a very unwelcome imposition. It takes a lot for us to imagine there can be enough improvement for the IMF to play a positive role. Of course that might be different in our governments. Some governments think in the same way as the IMF, or they have no choice to think differently. With the IMF’s catalytic role in stimulating foreign direct investment, you are sort of hostage to that situation. The signalling function of the IMF is still very much there and powerful. There is still a very strong sense we in the South, our governments, cannot run counter to the prescriptions of the IMF, and that is problematic. Surveillance is one of the ways in which the IMF sets global macroeconomic policy. In our study Women as “underutilized assets” (see ActionAid’s website), we have looked at how gender is incorporated in surveillance over the last 4 years, with an explicit focus on female labour force participation. To start off, we see positives in the theoretical work of the IMF on gender, solid insights etc. However, I do not see that translating into practice in a coherent and consistent way. Looking at 124 reports for 2016, in 28 of these, we have identified advice to increase female labour force participation. In these 28 cases, it is not very clear to us why these countries have been given the advice and not others. We have cross-referenced this for example with actual female labour force participation rates and the GII and found no clear correlation. For 23 countries that have been given practical advice, we see solid mentions of child care, education opportunities, etc however, the main question is: Is the recognition for the fiscal space needed there? If one paragraph talks about increasing female labour force participation but the rest talks about fiscal consolidation, this is contradictory. 22 of these 23, so the overwhelming majority, were also advised to increase or not deviate from fiscal consolidation, and most of this advice focused on austerity measures. 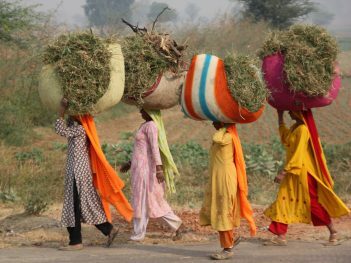 Is it possible to increase female labour force participation in a way that does not provide just any work but looks at the decent work agenda? Is it possible to address the total time of women and men spend on work? We know that increasing female labour force participation has not necessarily translated into good work for women, and that matters. While we know that female labour force participation can increase growth, we do not see such an obvious relationship between increased female labour force participation and gender equality more broadly. So, we need to make sure the strong theoretical work is translated into surveillance and lending policy advice and a more comprehensive understanding of gender and macroeconomic policy is applied. Q: SG said that for closing gender gaps there has to be investment in education, healthcare, etc. What are the experiences to change the political culture to invest in these things? Q: I was struck by how bound governments must feel, on the one hand they are pushed to spend on gender equality by people like the World Bank and on the other they are pushed to cut this through austerity. Could the panel comment on this sometimes conflicting policy advice coming from Washington? Q: I see overlaps in the presentations made here and Christian Aid’s work on IMF policy in LACs. My question is also about the contradictions that governments are facing, but specifically those coming just from the IMF. How is the IMF tackling this contradiction identified by the panel? Q: Looking at women in the informal economy, austerity measures push more women into the informal economy. Often when female labour force participation increases, women find themselves in low paying wages and the labour share of income goes down. So, what are the thoughts of the panel on the IMF making increasing female labour force participation into conditionalities? We know from very recent research that the number of IMF conditionalities is on the rise. To we take a principled stand against conditionalities or encourage them to have what might be positive conditionalities? On what is valued, mostly the IMF deals with the productive economy, and less attention is paid to the reproductive economy. Not recognising this is where the contradiction starts building up. Governments are therefore indeed under a lot of conflicting strain. I believe mapping fiscal policy and gender equality I think is where the IMF could play a positive role. What we need to understand and flesh out is how entering the work force can be a positive experience for women and how their rights can be upheld while doing so. Conditionalities, increasing female labour force participation can be good for women’s rights or it can be terrible. If there is no social protection, if the quality of work is not taken into account, equal wages, and why women are not in the formal economy in the first place, women can end up facing double burden by entering. Clearly, any targets without considering what work women enter into will further entrench gender inequality. You asked about the coherence between the World Bank and IMF policies. I do see that coherence on a larger scale. Part of what provides that coherence is using public resources to leverage private investments. On the hand both these institutions push domestic resource mobilisation, but also austerity, so governments should use whatever is left to give incentives to the private sector. The push for PPPs is one example of that. On conditionalities, from the 80s onwards we have dealt with them in the Philippines and since then it has always been a fight against conditionalities. 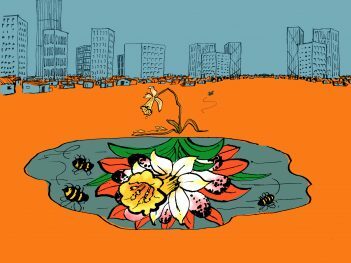 This is not just about the natural desire to exercise our own right to decide what to do with our economies, corruption aside, but also because conditionality approaches will lead you to failure because it is often a one-size-fits-all approach. Crises have different natures, impacts and outcomes. Because the IMF is not giving the right incentives to follow what can sometimes be good policy through conditions, as a prescription or imposition, it is not the right way. It does not motivate good policy discussions; it will just be what the IMF wants. It creates a bad dynamic. If a policy is good, let the merits be the main reason for it being adopted. If it is not good, then the negative impacts will be seen on a large scale. When I think about norms and macroeconomic policy, I think about the discourse in economics. We have a very hegemonic discipline that is very conservative in general. So the pipeline is incredibly narrow. It is hard to be a feminist economist and be taken seriously. LSE master degrees still do not let you take feminist economics as an optional. At Johns Hopkins as well, the curriculum is still incredibly narrow and hegemonic. We have looked at the potential of increasing fiscal space, so we are looking at tax evasion and avoidance, military expenditures, illicit flows and corruption. There is a lot more fiscal space out there than is often thought. Let’s think again about intergovernmental tax bodies, and on conditionalities. I worked for ECLAC, I was flabbergasted that the policy menu was so limited. We were discussing inflation targeting – which seemed meaningless in a context where many economies were awash with M1 from money laundering. Why have we excluded other policy rules? For instance employment growth instead of inflation targeting as a decision rule that can drive policy (see Epstein 2003). On austerity and conditionality, I understand the concerns. I want to share one example of conditionality, the social protection spending floor, which almost all low-income countries have with IMF programmes. Our research shows that most have complied with these floors, and as a result public health spending tends to remain unchanged during IMF programmes and education spending goes up. Comment from audience: This social spending paper by the IMF was later criticised for its flawed methodology. Independent researchers at Cambridge University worked with the same sample and actually found while education spending remained constant in these countries under IMF programmes health spending decreased by 1.7 per cent as share of GDP (see Observer Summer 2017). Question: It seems the IMF’s work agenda is narrow and unambitious, not challenging the root causes of gender occupational segregation. How do we address that through broader IMF policies? Question: On social spending floors, in addition to the research mentioned, we are now looking at it in the context of fiscal consolidation. For those of us that question the need for fiscal consolidation in the first place this is problematic. Also, these spending floors tend to turn into spending ceilings in practice. When is the IMF going to defer to other spending floors calculated by others, for example those calculated by UN organisations for reaching countries’ commitments to the SDGs. In many ways we are grateful to have this conversation with the Fund. These types of conversations should continue and become more substantive. I agree with the audience member it is absolutely critical we make sure spending floors do not become spending ceilings on social issues. There has been some interesting work between the IMF and the ILO recently, by Ortiz and Cummins on fiscal space (see ILO study). I would strongly encourage the IMF to revive that collaboration (see Observer Autumn 2017). Treating floors as ceilings, I agree that is a problem. A common belief is that gender segregation is decreasing, but recent ILO data found occupational gender segregation is actually increasing. This highlights that only raising female labour force participation rates will not generate gender equality. The ILO and UN Women have done a lot of good thinking on this. In terms of the best way forward, tapping into this research is good if the IMF is really dedicated to its rhetoric. Using the instrumental argument as the IMF at times has can be effective sometimes but is also extremely dangerous. We need to reframe the issue. What can the IMF do on the gender agenda? Assisting member countries in creating fiscal space is perhaps the best way the IMF could do this. 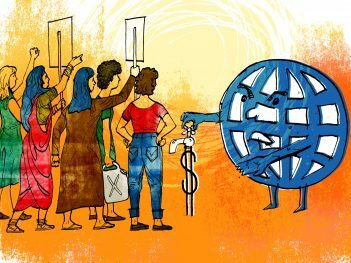 Demand the IMF and World Bank stop fuelling inequality. Both institutions must make a complete break with the neoliberal paradigm, without that anything they do on gender equality will be completely diminished or negated. We can tinker with individual policies, but we need to look at the whole paradigm and see how they approach this as a whole. The policy advice used to be only a part of what the IMF does, now it is their main role. That is a problem. To think of an institution as the best place for macroeconomic policy advice that has lending power, that is a very dangerous situation. Then all countries will start believing this. Do we want such an institution that presents itself as the only correct way to approach macroeconomic problems? Question: To ask the million-dollar question, when are we going to see a discernible decrease in the IMF’s policy advice promoting fiscal consolidation because of its harmful impacts on inequality? In terms of the IMF’s mandate, it is important to address issues that are macro-critical where we have expertise. There are many things that can be addressed there and we are working on them, like gender-responsive budgeting. But we are not necessarily the best suited to answer many questions, as we are not the experts in this field. We would be fooling ourselves to think we can fix all things just with fiscal policy for instance. We have to be humble and focus our efforts; we have a finite budget also, so we should not overstretch ourselves. In terms of austerity, I have been involved in very painful programmes, nobody likes it. It is not something we treasure. It is something we know has consequences, major social consequences. At the same time, you cannot defy gravity. You have countries who are really at the edge, who don not have access to the market. They are not collecting revenues. They are completely stuck. What would you do in that situation? Just like your household, how do you fill this whole? (see Guardian article on why a public budget is not like a household budget). That is something we have spent a lot of time on. Is there a way to make it more gradual? Are there ways in which spending can be reprioritised differently? It is about making the best of a bad situation. To answer the last question, I hope this will happen, but I cannot insure countries won’t need fiscal consolidation. We all have to be very aware we have to make choices. We have to make trade-offs. We have to be fully aware of the benefits of those. On labour, in Japan, we have made a series of recommendations that seriously tries to tackle occupational segregation. A journey of a 1,000 miles starts with one single step. The journey is long. Do I think we are making a difference? Yes, yet we have to admit we are not where you want us to be. Fora like this are important to understand where we need to go. What do I hope for what happens in the next decade? My hope is that policy makers are increasingly aware of the importance of gender equality because of economic reasons. I do think we need that to change things. Part of the role of the IMF is to make policy makers aware of this. 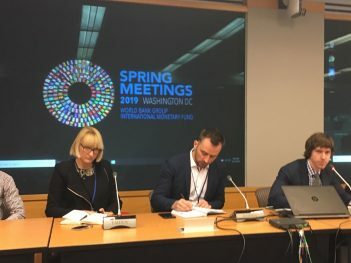 Notes from a meeting at the IMF/World Bank CSO Forum at the 2016 Spring meetings, exploring human rights, social policy and gender equality, examining the IMF’s pilot surveillance work on inequality and gender and the World Bank’s new gender strategy. Notes from the 8 October session of the World Bank gender strategy at the IMF and World Bank Annual Meetings CSO Policy Forum 2015. Notes of a meeting with UK World Bank Executive Director Gwen Hines 25 February 2015. 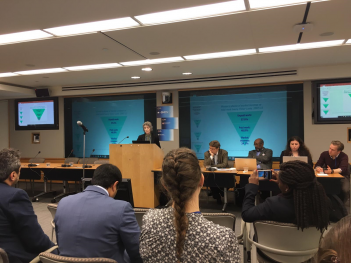 Civil society organisations met UK Executive Director to the World Bank and staff from the Department for International Development to discuss water, the Bank's private sector approach, health and nutrition, safeguards review and energy strategy. The World Bank's current approach to gender mainstreaming promotes women's empowerment as "smart economics" that serves a dual equality-development purpose. This approach, which largely ignores non-economic sources of gender inequality, has been criticised for its narrow, market-driven focus. Originally drafted as internal operational policies to guide staff, World Bank safeguard policies evolved after pressure from environmental and social groups in the 1980s and were first officially implemented in 1998. They aim to protect people and the environment from the adverse effects of Bank-financed operations and are based on international agreements, even if these protections are not explicitly provided for in the borrower country's national law.